During the Italian High Renaissance, the spirit of Humanism abounded, in which artists were deeply entrenched in a study of the humanities to consistently better themselves as people of the world. A person immersed in the comprehension and accomplishment of such varied interests would become later termed a "Renaissance man." 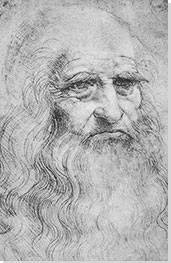 Leonardo da Vinci was the first prime exemplar of this term. Although his exhaustive personal interests led to his mastery of multiple fields, he is widely considered one of the greatest painters of all time. His iconic works continue to be studied and revered today. Leonardo was a polymath, someone whose level of genius encompassed many fields including invention, painting, sculpture, architecture, science, music, mathematics, engineering, literature, anatomy, geology, astronomy, botany, writing, history, and cartography. He is known to have said, "Learning never exhausts the mind." Despite his exhaustive explorations into multiple areas of expertise, Leonardo is primarily celebrated as a painter. Some of his works have consistently been regarded with a timeless, universal fame such as his enigmatic portrait The Mona Lisa, his most reproduced religious work of all time, The Last Supper, and his the Vitruvian Man, an early instructive drawing of precise spatial and anatomical symmetry. Leonardo's contribution to the aesthetic and techniques of High Renaissance art evolved Early Renaissance forebears such as linear perspective, chiaroscuro, naturalism, and emotional expressionism. Yet he exceeded many prior artists through his particular meticulous precision and the introduction of new methods such as his sfumato technique, a new way to blend glazes that resulted in works that appeared so realistic, it was as if his subjects lived and breathed from within the pictorial plane. Working at full capacity with both left and right sides of his brain, Leonardo's unquenchable curiosity and inventive imagination produced many contributions to society that were ahead of his time. He is credited with making the first drawings that preordained the parachute, helicopter, and military tank. His notebooks are nearly as esteemed as his artworks. Within, they represent a culmination of his life's work and his genius mind, containing drawings, scientific diagrams, and his philosophies on painting. They continue to be studied today by artists, scholars, and scientists worldwide. Leonardo di ser Piero da Vinci, described as one of the most gifted and inventive men in history, was born in 1452 in a village near the town of Vinci, Tuscany. This painting presents the Madonna with infant versions of Christ and John the Baptist, along with the archangel Gabriel. The quartet sits amongst a mystical, imagined landscape that exemplifies Leonardo's acuity with depth of perspective. Juxtaposed with the intimate group in the foreground, the fully imagined environment of desolate rocks and water lends a dreamlike quality both infusing the viewer with the sense of merging with the heavenly as well as witnessing a resonant experience of human-like tenderness. St. John was the patron saint of Florence and his depiction in this piece was important. According to Florentine tradition, he was a playmate of Christ, but he was also aware of Christ's future sacrifice for mankind. Like other artists of the time, Leonardo was interested in presenting known religious narratives in an un-idealized way, thus humanizing the secular. The picture utilizes a pyramidal arrangement common of High Renaissance artists, although Leonardo's perfection of anatomical movement and fluidity elevates the figures with a sense of realistic motion. Their gestures and glances create a dynamic unity that was innovative for the time. Also, his sfumato style is present in the way colors and outline blend into a soft smokiness, also intensifying the naturalist feel and giving the space three-dimensionality. The painting is an early example of the use of oil pigment, which was relatively new in Italy, and allowed the artist to capture intricate details, also leading to the real life feeling of the piece. This painting has been widely influential. Author Angela Ottino della Chiesa identified some of the paintings derived to some degree from the work including Holy Family and St. John by Bernardino Luini, the Thuelin Madonna by Marco d'Oggiono, and the Holy Infants Embracing by Joos van Cleve. Flemish artists such as Quentin Matsys have also copied the image. The Duke of Milan, Ludovico Sforza, commissioned this portrait. In it, Leonardo depicts Sforza's sixteen-year-old mistress Ceclia Gallerani. She peers to the right, as if her attention has been caught by something happening just outside the painting's frame. She bears a look of poised knowing in direct opposition to her age. The smile, slightly coy, seems to suggest her confidence in her position at the Court, and the knowledge of the power in her beauty. She holds an ermine, bearer of the fur that was used in Sforza's coat of arms, which was added later to the portrait at the subject's request. The paradox of the ermine is that it is also a symbol of purity, embraced by a young woman prey to the sensual needs of an older man in what was a very chauvinistic age. But other interpretations suggest the ermine is representative of Cecilia's fidelity to the Duke. Leonardo's genius in this work was in capturing a complicated emotionality through a look and a sideways gesture unconventional for portraiture. His study of the human body and its movement allowed for this precise capture of expression that is layered with subtle undertones that intrigue the viewer and invite them into the intimate world of his subject. Its lifelike immediacy captivated audiences. As art critic Sam Leith put it, "Give the painting a really good, close look and you'll see she really does have the very breath of life in her...just distracted by a noise, caught in a living moment..."
Oddly enough, Lady with an Ermine has found an unusual cult following in contemporary society. It was one of the visual inspirations for Phillip Pullman's concept of daemons in the His Dark Materials books (1995-2000). It has also inspired characters in film, science fiction, and video games. Vitruvian Man depicts a man in two superimposed positions. In one position, the man's legs are together with arms outstretched in demonstration of the volume of a square. In the second position, the man's legs stand apart and his arms extend to demonstrate the circumference of a circle. The shading and delicate drawing of elements such as the hair give the drawing a three-dimensional graphic feel. In the accompanying text to the drawing, Leonardo describes his intention to study the proportions of man as described by the first century BC Roman architect Vitruvius (for whom the drawing was named) in his treatise De Architectura (On Architecture, published as Ten Books on Architecture). Vitruvius used his own studies of well-proportioned man to influence his design of temples, believing that symmetry was crucial to their architecture. Leonardo used Vitruvius as a starting point for inspiration in his own anatomical studies and further perfected his measurements, correcting over half of Vitruvius' original calculations. The idea of relative proportion has influenced western Renaissance architecture and beyond as a concept for creating harmony between the earthly and divine in churches, as well as the temporal in palaces and palatial residences. Ultimately, The Vitruvian Man is a mathematical study of the human body highlighting the nature of balance which proportion and symmetry lend us, an understanding that would inform all of Leonardo's prolific output, in art, architecture, and beyond. It also nods to Renaissance Humanism, which placed man in relation to nature, and as a link between the earthly (square) and the divine (circle.) It combines the great thinker's comprehension of science with his excellence in draftsmanship. The image is truly legendary and has shown up referenced in numerous works of other artists from William Blake's Glad Day or The Dance of Albion (c.1794), to today's contemporary art scene as in Nat Krate's Vitruvian Woman. The Duke of Milan, Ludovico Sforza, commissioned The Last Supper for the refectory of the Convent of Santa Maria della Grazie. It reflects the famous story of the last meal Jesus shared with his disciples before his crucifixion, and more specifically, the moment after he has told them that one of them would betray him. Each of the apostles is individually rendered in various expressions of consternation, disbelief, and amazement as Judas stands in the shadows clutching the purse containing the thirty pieces of silver he received for his betrayal. Jesus sits central, reaching for bread and a glass of wine referring to the Eucharist. Behind him, through the windows, splays an idealized landscape, perhaps alluding to heavenly paradise, and the three windows may denote the holy trinity. Never before had such realism been used to depict the classic drama of that pivotal moment on the eve of Christ's journey toward crucifixion. The authenticity and intricate detail coupled with the use of one point perspective, placing Jesus at the crux of the pictorial space from which all other elements emanated out from, was to herald in a new direction in High Renaissance art. Furthermore, the use of the vanishing point technique complimented the painting's refectory setting, allowing for the piece to mesh into the space as if it were a natural extension of the room. All of these elements greatly influenced, and were used by, Leonardo's peers of the time including Michelangelo and Raphael. Because the water-based paints typically used for frescos of this type were not conducive to Leonardo's signature sfumato technique, he opted for oil-based paints for this work. Unfortunately, the oil upon plaster combination would prove disastrous, as before the artist's death, the paint already began to flake from the wall. The masterwork has been consistently restored over the centuries, the last effort lasting 21 years before completion in 1999. Very little of the original paint remains. This preliminary drawing shows the Virgin seated next to her mother, St. Anne, while holding the baby Jesus, and with St. John the Baptist as a child looking on. Mary's eyes peer down at her Christ child who points to the heavens as he delivers a benediction. The piece is very large in size, consisting of eight papers glued together. Also known as the Burlington House Cartoon, it is presumed to be a sketch in planning for a painting. Although, the painting either no longer exists or was never created. 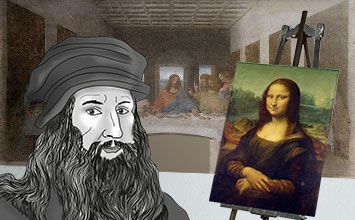 Leonardo often used a "cartoon" such as this to create a pre-drawing, which would then be applied as a transfer onto the actual painting surface. Once applied, a pin would be used to prick outline the work onto the surface as an under guide for the artist. Because this piece is impeccably preserved, it is assumed it never made its journey into a full work of art. The drawing is notable in that it reflects Leonardo's perfectionism, even in planning for a work of art. His acuity with anatomy is present in the realistic ways the figure's bodies are shown in various gestures of interaction with each other. Genuine tenderness is conveyed in the faces of the women and St. John as they reflect upon the focal point of Christ. The amount of detail captured, even in a work not originally intended for viewing, showcases the artist's meticulous process and mind. Leonardo's drawings, even, are so technically perfect, that they are also considered just as fine pieces of art as his finished masterpieces. Many were admired and shown both at the Court and in public exhibitions during his life and after. King Louis XVII of France is said to have commissioned Salvator Mundi after his conquest of Milan in 1499. The painting is a portrait of Jesus in the role of saviour of the world and master of the cosmos. This is reflected through symbolism. His right hand is raised with two fingers extended as he gives divine benediction. His left hand holds a crystalline sphere, representing the heavens. This is an unusual portrait in that it shows Christ, in very humanist fashion, as a man in Renaissance dress, gazing directly out at the viewer. It is also a half-length portrait, which was a radical departure from full-length portraits of the time, making the overall visage one imbued with an intensified intimacy. It is representative of the mastery of all of Leonardo's signature techniques. The softness of the gaze, acquired through sfumato lends a spiritual quality, inviting veneration from the viewer. The extreme realism of the face encompasses an emotionality and expressiveness defined by the artist's acuity with anatomical correctness. The darkness and shadow create a depth, which in contrast with the light emanating from the chest presents Jesus as a formidably light filled being. Salvator Mundi was sold at auction in 2017 for an unprecedented $450.3 million dollars, a testament to the timeless appeal of Leonardo's masterpieces and evidence of the importance of his legacy that remains monumental to this day. The Mona Lisa, also known as La Gioconda, is said to be a portrait of Lisa Gherardini, the wife of a Florentine merchant named Francesco del Gioconda. The innovative half-length portrayal shows the woman, seated on a chair with one arm resting on the chair and one hand resting on her arm. The use of sfumato creates a sense of soft calmness, which emanates from her being, and infuses the background landscape with a deep realism. Chiaroscuro creates a profound depth in this piece, which keeps the eye moving across the painting. But it is her enigmatic smile that magnetizes the viewer, along with the mystery of what's behind that famous smile. This work is one of Leonardo's most iconic for multiple reasons. Prior portraits of the time focused on presenting the outward appearance of the sitter, the personality of the subject only hinted at through symbolic objects, clothing, or gestures. Yet in this painting, Leonardo's desire was to capture more than mere likeness. He wanted to show something of her soul, which he accomplished with his great emphasis on her peculiarly unconventional smile. She is not simply smiling for the artist; she is caught in a particular moment of feeling. The viewer is left to wonder what she was thinking, what the smile might have meant, and who she was. The ambiguity of expression invites us to engage with the work on a personal level as we resonate with the very humanist depiction of being caught mid-emotion. The landscape is also important in delivering this sense of soulfulness. There has been much speculation as to its origin of location yet it is more widely construed that it is imaginary, a made up compilation from Leonardo's mind that could also allude to our admittance into Mona Lisa's dreamlike interior world. This painting has been held in high esteem and surrounded by a sense of awe continually for the last five hundred years since it was painted. It has inspired many artists as well. Raphael drew upon it for a drawing in 1504. Countless writers have written about her, like French poet Theophile Gautier in the 19th century who called her "the sphinx who smiles so mysteriously." It has been parodied endlessly from the 1883 caricaturist's Eugene BatailleMona Lisa smoking a pipe to the 1919 Marcel Duchamp readymade showing her with a moustache and beard. In 1954, Salvador Dalí created his Self-portrait as Mona Lisa and in 1963 Andy Warhol included her in his seminal silkscreen output with Mona Lisa "Thirty are better than one." Her image has also been reproduced endlessly on multiple prints, posters, and commercial products in the contemporary popular culture markets.